The Bideford AAC Rowing Section was founded in 1897 and is one of the premier clubs in the West of England. We welcome rowers of all abilities whether you are interested in learning to row or are an experienced rower. Training sessions depend on tide times. Rowers who are interested in joining are welcome to try sessions to see if it’s for them. For Junior Rowing children must be age 11 and above. The Rowing Section is affiliated to the West of England Amateur Rowing Association (WEARA). It was a trip to Nottingham for the British Master’s Championship for Dave Byrnes and Alistair Peake who took part in the D doubles race. They won their heat but narrowly missed out to Wallingford in the final and had to settle for second place. 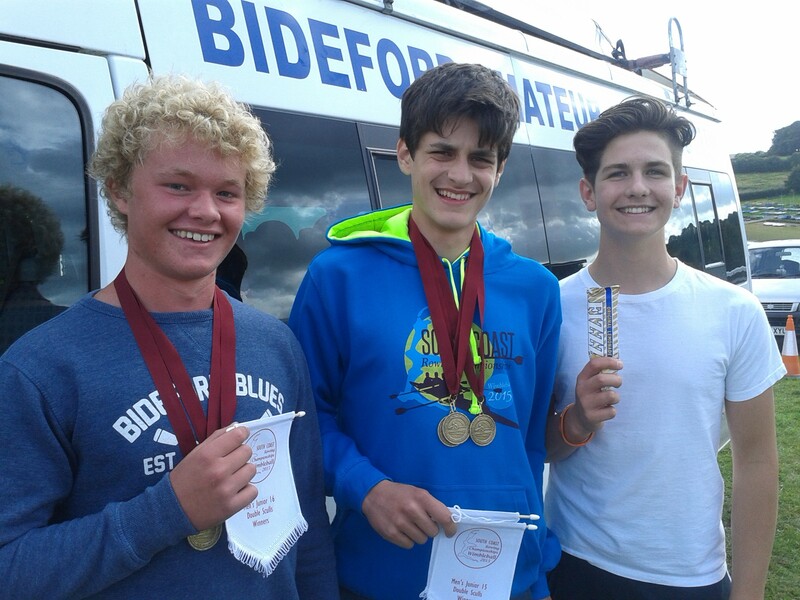 Ten firsts, five seconds, four thirds and Championship of the lake meant a very successful first regatta of the season for the Bideford Blues on Saturday. Men’s junior 16 4’s – Lucas Wilson, Jasper Beer, Alex Dualibi-Wilson, James Jordan and Tina Robertson (cox) who finished lengths ahead of the rest of the field. Men’s junior 14 4’s -Nell Geirke, Charlie Colwill, Toby Evans and Jack Berry. A good win for the young crew with Nell being the only girl in the crew but certainly holding her own. Men’s junior 16 doubles -Alex Dualibi-Wilson and James Jordan – Following his success in the 16’s quad and his scull race it was a hat-rick for Alex. A fantastic day of rowing for all the Blues crews whose points meant they secured the Championship of the lake, this is the first time the club has won this event at Wimbleball. On Saturday 23 April, two crews from Bideford Amateur Athletic Club attended the Junior Regional Rowing Finals in Nottingham. It was 3rd place for the junior coxed quad crew in a very tight race where only three seconds separated the top three crews. The crew of Jack Berry, Toby Evans, Charlie Colwill, Nell Gierke and Kirsty Snow (cox) narrowly missed out on the top spot which proved to be one of the most exciting races of the day. It was also 3rd place for James Jordan and Alex Dualibi-Wilson in the double sculls B final. The boys put in a very impressive performance on the 1500m course. All the young rowers attend Bideford College apart from Nell who attends Great Torrington School. It was the 59th South Coast Rowing Championship Regatta this weekend held at Wimbleball Lake. The Bideford Blues ladies under 18 crew of Shannon Monaghan, Charlotte Berry, Shelby May and Kirsty Snow were invited to compete in the ladies senior C championship race. They faced very strong competition from Hants and Dorset crews but put on a fantastic performance and finished a very creditable 3rd place. In the men’s masters championship race the crew of Colin Pennington, Steven Clements, Dave Burton and Neil Pennington finished in a very respectable 4th place. In the men’s junior 18 coxed fours race the scratch crew were also 3rd. On Sunday it was the turn of the younger rowers at the South Coast under 16 rowing regatta also held at Wimbleball. The conditions were dry but windy for the youngsters but that didn’t seem to cause any problems. It was three golds for Alex Dualibi-Wilson, firstly in the men’s junior 15 sculls when he had a clear win. Secondly he joined up with James Jordan in the men’s junior 15 double sculls and finally, again with James they won the men’s junior 16 double sculls. In the men’s junior 16 single scull race Lucas Wilson finished in 4th place. This was a great weekend of rowing to finish off the very successful season for the Blues. 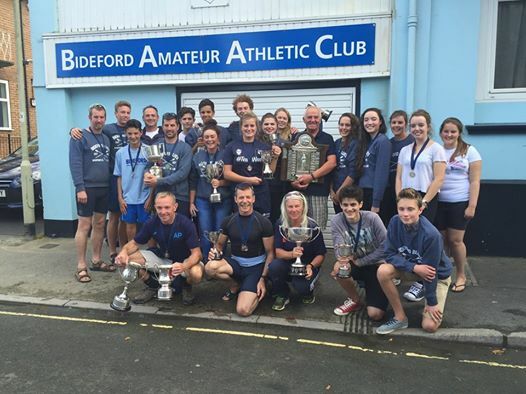 It was a fantastic end to the rowing season for the Bideford Blues rowers this weekend with outstanding performances on their home water. Following on from the success of Dartmouth regatta the club not only gained 13 first positions, 7 second place and 3 thirds, they also won the Billy Little cup and the Grimes Perpetual Trophy. The Billy Little cup is awarded to the local club (Bideford Reds or Bideford Blues) who has the most points on the day whilst the Grimes Trophy is presented to the overall champions of the river. All rowers put on an excellent performances, especially the two under 14 crews who were rowing their first regatta after having only six months of training. Although this was the last regatta of the season some crews will be making the short trip to Wimbleball Lake next week for the South Coast Championships. Crews include the men’s veterans, men’s novice, ladies under 18’s / senior C and Alex Dualibi-Wilson and James Jordan in the pairs and scull races. Crews from all over the south of the country came and took part in the largest regatta of the season at Dartmouth on Thursday. After an unsettled week the sun shone and so did the Bideford Blues bringing home six wins, two second places and two thirds. The first win of the day came from Declan Monaghan in the men’s novice skulls race. Next was the men’s junior 16 double scull when Alex Dualibi-Wilson and James Jordan brought home their first win of the day. It was an excellent performance by the men’s novice fours crew of Brian Andrew, T Hendy, Declan Monaghan and Charlie Colwill (cox) also coming home in first place. It wasn’t just the men bringing home the golds though, Shannon Monaghan, Shelby May, Charlotte Berry, Kirsty Snow with Tina Robertson (cox) came home first in the ladies junior 18 fours whilst Lorna Colwill and Hayley Wilson teamed up with Brian Andrews and James Yeo with Charlie Colwill (cox) to take first in the mixed novice fours race. The race of the day had to be the men’s novice double scull race. Alex Dualibi-Wilson and James Jordan faced tough competition and looked to be having to settle for second place, however, keeping cool heads and rowing strong the boys battled back and came home in first place. It was second place for Shannon Monaghan in the ladies junior 16 scull race and Annie Cook in the ladies senior C scull race. The veteran crew of Colin Pennington, Steve Clements, Nigel Cann, Neil Pennington and Chloe Pennington (cox) had to settle for third place as did the ladies senior A fours crew of Zoe Robertson, Annie Cook, Shelby May, Kirsty Snow with Tina Robertson (cox). Photo shows Alex and James who won two races. 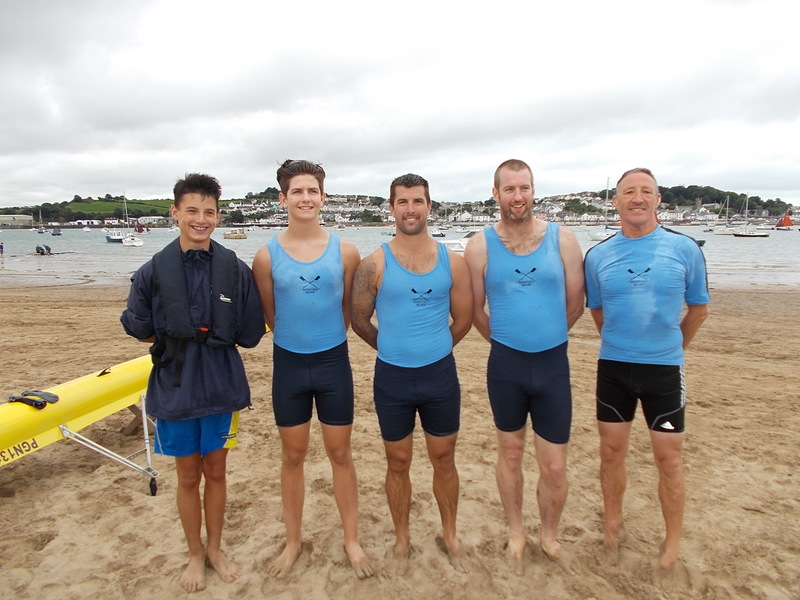 It was a disappointing day on Saturday for the Blues rowers who travelled to Paignton and only managed a few 2nd and 3rd positions before the regatta was cancelled because of high winds and rough sea conditions. It was a different story on Sunday when the crews travelled back to home territory and took part in the Appledore and Instow regatta notching up eleven wins, four second positions and three thirds. The wins came from the men’s senior B fours race with Dave Bates, Dave Powe, Dave Burton and Alastair Peake who won by quite a distance. Lucas Wilson won the men’s junior 15 sculls race, next was the mixed senior B crew of Zoe Robertson, Annie Cook, Dave Byrnes, Milo George and Tina Robertson (cox). Annie Cook went on to win the women’s senior C scull race. The wins continued from the women’s senior C fours crew of Charlotte Berry, Keeley Mills, Shelby May, Kirsty Snow and Tina Robertson (cox). It was the first win of the season for the men’s novice four crew of James Yeo, Brian Andrew, Dave Bates, Lucas Wilson and Charlie Colwill (cox).It was two wins for James Jordan and Alex Dualibi-Wilson who won the men’s junior 16 doubles race, they also went on to win the men’s junior 15 doubles. The men’s senior A sculls race was won by Dave Byrnes. Kirsty Snow, Shelby May, Annie Cook, Zoe Robertson and Tina Robertson (cox) won the women’s senior B fours race. Alastair Peake, Dave Bates, Mandy Mills and Sam Thompson (A crew) won the mixed open fours race. The second positions came from the B crew in the mixed open fours race of Chris Michael, Dave Powe, Dave Burton and S Dolby. Alastair Peake and Dave Byrnes were second in the men’s senior C doubles race and Lucas Wilson was second in the men’s junior 16 sculls race. The women’s senior C fours B crew of Chris Michael, M Mills, S Dolby, S Thompson and Dave Powe (cox) were also second. It was third place for the women’s novice fours crew of Chris Michael, M Mills, S Dolby, S Thompson and Dave Powe (cox). Third for the mixed senior C fours crew of Shelby May, Brian Andrews, James Yeo, Hayley Wilson and Charlie Colwill (cox) and third for Charlotte Berry and Kirsty Snow in the women’s junior 18 doubles. The club narrowly missed out on the championship of the river to Plymouth Rowing Club. All in all a very successful day of rowing for the club. This weekend saw rowers from the Bideford Amateur Athletic Club travel to Totnes for the annual regatta. Although Saturday offered sunshine for the sprint events it was wet and windy conditions that the welcomed the club for the WEARA Championship event on Sunday. Fortunately this didn’t dampen the rower’s performance. It was just the one win for the club on Saturday with Alex Dualibi-Wilson winning the junior 15 sculls race. On Sunday, with Neil Pennington still on holiday Dave Byrnes once again stepped into the men’s master’s crew. He was joined by Steve Clements, Nigel Cann, Colin Pennington and Chloe Pennington (cox) and came home in 1st place. The women’s junior 18 fours crew of Kirsty Snow, Shelby May, Shannon Monaghue, Keeley Mills with Tina Robertson (cox) had to settle for 3rd place. Kirsty and Shelby along with Annie Cook, Zoe Robertson and Tina Robertson (cox) stepped up three categories and took part in the women’s senior A fours race. Two of the crew are still under 18 but they put on a very good performance and came home in 2nd place. It was also 2nd place for Declan Monaghue in the men’s novice scull race. Greenbank Falmouth Rowing Club hosted this weekend’s championship regatta. The 1000m course which was held at Stithians Lake. It was 1st place again for the under 18 ladies crew of Charlotte Berry, Kirsty Snow, Shelby May, Jo Moulder and Tina Robertson (cox). The girls went on to compete in the ladies senior C race, putting in a very strong performance and coming home in 3rd place. Also coming home in 1st place was James Jordan and Alex Dualibi-Wilson in the under 15 junior race. In the men’s veteran race Colin Pennington, Nigel Cann, Steve Clements and Dave Byrnes took 2nd place. Dave Byrnes was joined by Alistair Peake in the open men’s pairs race and again took 2nd place. It was 4th place for the men’s novice crew whilst the men’s senior C crew had to settle for 5th position. This Sunday was the christening of a new coastal rowing boat which is to be used as a training aid for the junior rowers of the Bideford Amateur Athletic Club. The boat was supported by the Bideford Bridge Trust along with sponsorship by local butcher’s By the Ford of the High Street, Bideford. The boat was officially named By The Ford by Tina Robertson (owner of By the Ford butchers) and Alice Jackson who started her rowing career as a junior rower at the Bideford Blues and has now gone on to row in the England squad. Bideford Amateur Athletic Club is truly grateful to the Bideford Bridge Trust and Tina Robertson for their very generous support of the club. The photo shows Alice Jackson with Tina Robertson, owner of By the Ford naming the new boat.